The straight-ahead jazz album inspired by life around the city by the bay drops September 7. BERKELEY (22 August 2018): Trumpeter Erik Jekabson spent nearly five months composing new music while going about his San Francisco Bay Area life before gathering his sextet at the legendary Fantasy Studios in Berkeley to track "Erik Jekabson Sextet," which drops September 7 on Wide Hive Records. Inspired by places, events, moods and ideas, the nine original compositions that he wrote for his seventh album were recorded all in one day with Gregory Howe in the producer's chair. 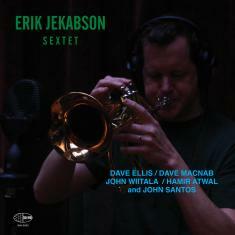 Jekabson regathered the musicians - guitarist Dave Macnab, saxophonist Dave Ellis, drummer Hamir Atwal and bassist John Wiitala - who appeared on his 2017 outing, "Erik Jekabson Quintet," and added seven-time Grammy-nominated percussionist John Santos. Hazy stop lights and blurred lines mix and meld on "San Pablo Avenue," a richly-textured tune that combines some of Jekabson's trademarks: lyrical melodies, unexpected rhythmic shifts and modern harmonies. The transcendent "Floating Song" unfolds at a deliberate pace, slowly adding layers, countermelodies and builds in intensity over a solemn bass line. "The Hills of Santa Cruz" is an atmospheric sojourn featuring Jekabson's dark trumpet tone and Macnab's nuanced guitar accompaniment. The pace picks up on the charismatic "Chrysalis," a grooving Brazilian baiao showcasing Santos' skillfully-layered percussion and special guest keyboardist Matt Clark. Humor and quirkiness abound on "Cat and Mouse"; the storming "Hive Wide" slashes a soulful path highlighting Ellis' tenor saxophone; and "Gentle Wave" washes over the shoreline full of restraint and grace. A literal "Change Up," the outfit gets into a swinging mood on the head bobbing, finger-popping jaunt propelled by the tight hookup of bassist Wiitaka and drummer Atwal. "Medjool" closes the collection with a Middle Eastern-flavored melody featuring Santos's rife embellishments. "This recording is a documentation of the sounds of my busy life here in the San Francisco Bay Area, interpreted by some of my favorite Bay Area musicians. I suppose all composers are influenced by their environment and I'm no different. I wrote music for this particular band, but I allowed the ideas and inspirations for the songs to come to me as I went about my life here. I would hear the beginnings or seeds of these songs at different times - sometimes during reflection, sometimes while traveling, often when watching something that interested me and made me think, ‘How would this sound if it were a piece of music?' I would immediately sing most of these musical ideas into my iPhone and then sit down at the piano later to finish them. I was able to envision the sound of these particular musicians when writing as we've been playing and recording together now for a few years," said Jekabson, a musician, composer, arranger, band leader, educator, mentor and author who manages to balance his life with aplomb. "I came up with the compositions for this album in between gigging, teaching, running the Young Musicians program at the California Jazz Conservatory, leading the Electric Squeezebox Orchestra Big Band, arranging and composing for other projects and getting prepared for the birth of my second daughter," said Jekabson who will support the new record with a series of album release concerts throughout the Bay Area (Sept. 28 in San Jose, Sept. 29 in Oakland and Oct. 12 in San Francisco). Jekabson debuted as a leader on 2002's "Intersection" and his solo records have placed him in a variety of band configurations. After earning a master's degree from the San Francisco Conservatory of Music in 2005, he's been busy in the San Francisco Bay Area music scene, co-producing and performing on two Electric Squeezebox Orchestra albums. Last year, Jekabson played alongside Kamasi Washington as part of Throttle Elevator Music. As a sideman, he performed on iconic late-night television shows - from Letterman to Leno - and/or toured with John Mayer and Galactic. His deft touch as an arranger has burnished works by an interesting assortment of vocalists including Madeleine Peyroux, Ani DiFranco and Jane Krakowski as well as a host of orchestras, symphonies and jazz ensembles. Jekabson regularly serves as an instructor at Jazzcamp West along with several esteemed workshops and institutes. In addition to the California Jazz Conservatory, he is on the faculty at several colleges and is a seasoned clinician. "The Hills of Santa Cruz"